T50 Summit of World Construction Machinery Industry (hereinafter T50 Summit 2017) will be inaugurated in Beijing, China on September 18-19, 2017. Just before the opening of BICES 2017. The every-two-year grand feast, started in Beijing in 2011, will be collectively organized by China Construction Machinery Association (CCMA), Association of Equipment Manufacturers (AEM), and Korean Construction Equipment Manufacturers Association (KOCEMA), co-organized by China Construction Machinery magazine, for the consecutive fourth time. Well recognized and supported by all industry colleagues, the past events became one of the best for profound speeches and discussions on industry development, market outlook, customer demand evolution and renewed business models, among and by high-profile industry leaders, top management from global major manufacturers as well as domestic ones. Global construction machinery industry is back on track of growth, particularly notable growth in China. At T50 Summit 2017, in discussions will be put forward questions and topics like how long will the growth momentum continue? Is the market recovery solid and sustainable? How much significance will China’s growth bring to global industry? What are better business practices for multinational companies in China? How will Chinese domestic manufacturers adjust strategies and implement? What are the changes that are happening to end users in China market, after more than 4 years’ prolonged downturn? How will Chinese customer requirement and behavior upgrade and evolve? The answers can all be found at the summit. Meantime, key-note speeches and open discussions on the industries of excavator, wheel loader, mobile and tower crane, and access equipment will also be going in paralleled forums of World Excavator Summit, World Wheel Loader Summit, World Crane Summit & China Lift 100 Forum, World Access Equipment Summit & China Rental 100 Forum. 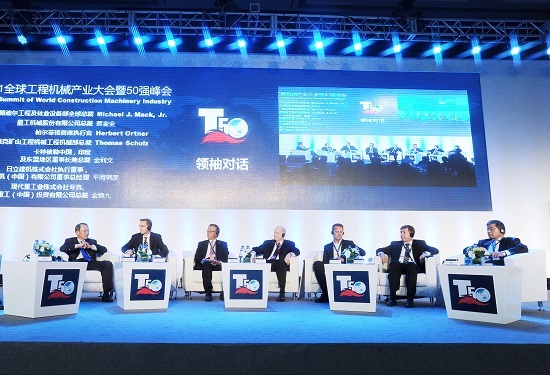 Prestigious awards will be also presented at the Gala Dinner of T50 Summit of World Construction Machinery Industry.